Keeping your house super clean can be challenging, especially when you have pets like cats or dogs at home. It’s easier to instruct your family members to maintain cleanliness inside the house. You can also do regular dusting and mopping and block the outside dirt from getting in. But your favorite pets like dogs and cats are innocent, and they may not take your instruction to keep the house clean. Pets like cats and dogs will most likely untidy your home unknowingly, and that makes it difficult to keep your house clean with pets. If you have pets at home and you’re struggling in keeping your house clean and organized, then I can understand your situation. But worry not, because today I am sharing the list of 12 essential tips that’ll help you to keep your house super clean with pets. There are many who don’t like keeping pets at home because they assume that keeping pets at home will make their house dirty and untidy. But only a true pet lover knows how much valuable their pets are for them. Some people get so close to their pets that they treat them like their own kids and family members, and I am one of them. However, it is hard to ignore the cleanliness of house, because it’s not good for your family member and pets. But, that does not mean that you will not keep pets at home. All you have to do is to put in more efforts in keeping your house clean and tidy. I am myself a pet lover, and a clean freak and I happily take little pains to keep my house clean and tidy. And if you are a pet lover like me, then I am sure I will be able to help you keep your house super clean with pets at home much efficiently. I am happy to share 12 of my secret cleaning tips that help me keep my house clean with pets like cat and dogs at home. Animals, if trained properly learn to lead a disciplined life, especially dogs. And, so you as a pet owner must teach them not to pee or poop just anywhere inside your home. Ideally you should take them outside or make them do in the bathroom, or keep a separate litter box for them. This is one primary thing that most pet owners must keep in mind. And, as far as the other home cleaning tips goes, you yourself have to take control, and I am going to tell you how. My easiest tips to keep your home clean with pets at home will help you a lot and make your cleaning efforts less complicated. Basically, you need to take some precautions from before so that your home does not get much dirty on the first hand. And even if it does, it will not take much time for you to clean it up. So are you ready to learn how to keep your house clean with pets at home? 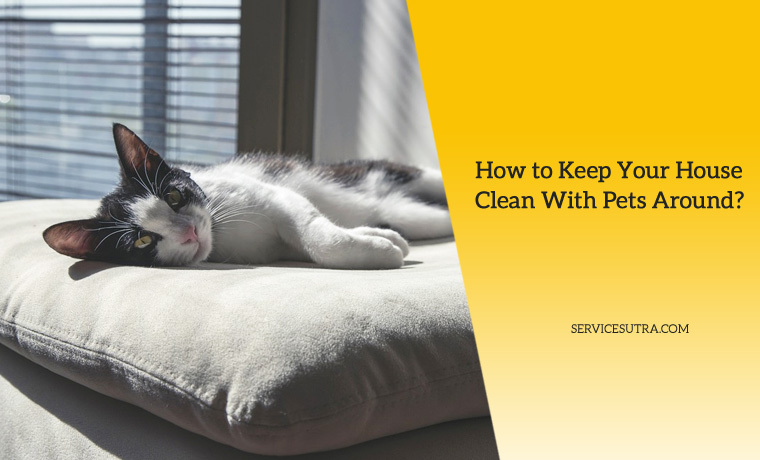 I think you are, so without wasting much time, let us start with the essential cleaning hacks that’ll help you to keep your home clean with pets at home. Avoiding to keep pets at home is like running away from the problem. But if you are a real pet lover, you will keep your pet at home and also ensure that the house is properly clean and well organized for comfortable and healthy living of your family and pet. The first and foremost thing that you need to do to keep your home clean with pets at home is to ensure that your pets are clean all the time. Your pet does not have that sense to take bath frequently so you need to make them bath. Wash them thoroughly with a good pet shampoo every weekend and help them get rid of the stink on their body. They may not like the water at the beginning but slowly they will get used to it. The first secret hack to keep your home clean with pets around is to keep your pets clean. With pets in your home, there is going to be pet fur everywhere. And, it is not quite hygienic to keep your home full of furs for a long time, as that may easily enter your body in the means of food. So, the best way to deal with it is to vacuum your house frequently. Vacuuming will not just remove the furs but it will also remove the other dirt and dust particles inside your home. But with pets around, you will have to do it quite often probably every 2-3 days if you want to keep the home thoroughly clean. And, if you really hate furs and cleaning your home that often, then you may avoid keeping dogs like Labradors, pugs, huskies, golden retriever that sheds furs frequently and keep Shih Tzus, poodles, Pomeranians etc. Talking about pet furs, a good way to deal with the accumulation of pet furs inside your home is to brush your pets regularly. This will reduce the shedding of the furs and will also keep the skin of your pet healthier. Most importantly, if you do the brushing of your pet outside, it will help you keep the interior of your home much cleaner from the pet fur build ups. If you have a pet at home, I am sure you know that your pets love sitting on the sofa. So, if you are allowing your pet to sit on your couch, you got to be prepared to see fur, vomit or other bodily specimens on it. In short, if your pets are sitting on the couch, then you have to clean your couch quite often. And, to make your work easier, it is best to choose the right fabric for your sofa. A leather or a microfiber couch is a good option to try as you can clean them easily in comparison to the silk ones which stains a lot or velvet ones that attracts lot of pet fur. In fact, any kind of thick weave fabric will be good for your sofa, especially when you have pets at home. You may match the color with your pet color to make their furs less noticeable just to avoid your home looking too dirty. But by just using the right kind of fabric for your couch, you will be able to keep your house super cool easily. The entrance of your home is clearly one of the highest traffic portions of your home. It gets dirty very easily especially when you have pets at home. It is obvious that when you take your pets outside, they accumulate lot of dirt and allergens which may easily enter your household along with them. So, it is better that you use some natural Hypo-Allergenic wipes to clean up your dogs before bringing them inside the home. These wipes are generally without any fragrance but they help to get rid of any kind of stink from your pet’s body. Another important thing that you may like to do is to keep a paw mat near the entrance of your home. Use one which is a microfiber chenille doormat which has the ability to absorb dirt, water or mud more than the other ordinary mats. I certainly feel it to be one of the best hacks to keep your home clean with pets around. Pet stains like for example; pet urine is something that needs immediate action. It is not just the stink but the urine, if kept for long can permanently discolor your carpet or any other item in your home. Hence, fast action is needed. Try to blot as much urine as you can, using an old but clean towel and then use the mixture of warm water and a good dishwashing liquid to get rid of the rest of the stains. Wash off the space again with warm water blotting and allow it to dry after that. It’s easier to clean the stains when it’s fresh and by adopting this simple cleaning hack, you will be able to keep your house clean much efficiently. If you are living in an enclosed space, it gets really suffocating after sometime and with pet stink lingering around, your house often feels low on energy. The best way to freshen up your home is to let the outside fresh air in. Open the windows during the day time as it will help you keep your home airy. It will not only energize the whole home atmosphere but will also help eliminate the stink lingering around as well. This is a good thing to do and this simple hack will help you keep your house clean with pets around. If you have a cat as a pet, then you got to keep a litter box for the cat. And, you know that cats hate anything dirty and so you need to scoop out the mess on a daily basis. At times, you may have to do it two-three times daily as well. Make sure you dump the waste in an outdoor waste bin so that the inside of your home stays clean and stink free. Whenever, you feel too much odor, know that it is time to clean up the box thoroughly. In fact, thorough cleaning of the box must be done every week. But, if you see that the smell still stays after that, then it is best to change the whole litter box and get a new one. However, to reduce your cleaning work, you may go for a covered litter box. This is a good idea as it lessens messy foul smell due to the digging and burying action of the cat, as well as it helps reduce foul odors. Pets in home means there is going to be fur everywhere including your own clothing. I am sure we all do laundry, but you have to be regular with washing your clothes, if you want to look fur free mainly when you are out. As it is, most of us prefer doing daily cleaning of the clothes to reduce the burden of washing too many of them all at a time. But when you have pets around, you have to make this your daily habit and you can’t afford to postpone the laundry. Clean the clothes daily in the washing machine and after that put the clean clothes in a room which is probably locked so that your pet does not enter there. This will enable your clean clothes to remain fur free until you wear them again. Most animals have the habit of spreading the food all around while eating which may make you clean a large area of your floor every time your pet has a meal. So, to avoid it, I would recommend you to put a place mat underneath the bowl, so that you just have to clean the mat afterwards. You may decorate the mat with animal prints probably to make your pet more comfortable with it. Most houses have proper pet beds for their pets and it is much needed. If you have a separate pet bed, then you need to ensure that the pet bed is regularly washed and it is clean. Although, it is best if you can do the cleaning on a weekly basis but if you cannot, then biweekly or monthly cleaning of pet bed is a must. I generally prefer and will recommend you to go for a machine washable pet bed as other beds may retain the odors. You may also take the help of an odor eliminating freshening spray to get rid of the stink completely. See, when you are taking your pet for a bath, it is very obvious that the loose furs will come off. Now, if you allow these furs to move to the drains, it may lead to the clogging of the drains shortly. So, what you can do is to cover the bath drain with any steel wool or drain cover. Then after you finish bathing your pet, immediately grab the hairs and throw into the garbage. After that, remove the cover and wash your entire bathroom once using water. This will enable you to keep your bathroom clean as well prevent the bath drain from getting clogged. This simple hack will help you surprisingly in keeping your house clean with pets around. Having a pet like a dog or a cat at your home can make your life fun. Besides the positivity, the main cause of concern that occurs with pets at home is to keep the home and pets properly clean. There are many who want to keep a pet at home, but avoid because they feel pets can make the place dirty. Well, you may have to work a little harder to keep the home clean with pets around, but there are ways to deal with it. Cleaning your house without a pet is a different thing altogether. But when you have pets at home, not only you have to ensure cleanliness and good hygiene for your family members, but also for the pets. I am sure you are aware of the challenges of keeping your home clean with pets around, but if you pay a little attention, then keeping your home should not be that difficult. I have already shared the list of top 12 cleaning hacks to keep your house clean with pets around. I regularly use these strategies to keep my home neat and clean most of the time and I am sure these tricks are going to work for you. If you have pets at home, then try using some of these cleaning hacks as discussed above and let me know how it helps you in keeping your house and pets super clean. Do you have a pet at home? How do you ensure cleanliness for your pet and your family member? Feel free to share your home and pet cleaning hacks by commenting below. Bye, for now. I’ll be back soon with some other interesting home improvement topics.